For twelve years now, the Glen Canyon Dam (GCD) Adaptive Management Program (AMP) has provided volumes of knowledge and understanding of the Colorado River ecosystem in Grand Canyon National Park, but has yet to fulfill its primary mandate to stop the cultural and biological degradation of this sublime landscape. The reason why the program does not work and remains an embarrassment to the watching world of ecosystem management professionals is the recalcitrant attitude of state agencies concerning the management of subsidized federal hydropower. October 30, 1992 - Grand Canyon Protection Act (GCPA) passed by Congress, which specifies that Glen Canyon Dam be operated in a manner that recovers the resource values of Grand Canyon National Park. February 14, 1993 - The lead researchers of aquatic ecology recommend the reestablishment of natural hydrological patterns below Glen Canyon Dam to restore the endangerd fish populations in Grand Canyon National Park and submit their report (1994 version). April 25, 1993 - Western Area Power Administration (WAPA) requests modifications to the proposed preferred alternative on operations at Glen Canyon Dam (GCD). The request is beneficial to hydropower production, rather than park values at Grand Canyon. Thus the stage is set for a management strategy to circle around the GCPA for the next 15 years. January, 1994 - Draft Environmental Impact Statement on operations at GCD is published (Federal Notice). 1994 - A Beach/Habitat Building Flow (BHBF), an experimental high flow release from GCD to restore beaches and sandbars is proposed. The water/power agencies claim it violates the Colorado River Basin Project Act of 1968 as an unwarranted spill (water bypassing the generators and the revenue they produce). Interior believes GCPA changed the definition of spill, because the bypassed water is now used for an additional purpose, the restoration of natural and cultural values in Grand Canyon. As of 2008, this fundamental debate remains unresolved and has undermined the intent of the GCPA. March 21, 1994 - Final ruling on critical habitat for the endangered fish of the Colorado River. November 17, 1994 - Meeting held to initiate planning for a science center to conduct monitoring (quantitative) and research (qualitative) in the Grand Canyon specific to adaptive management. Adaptive management is defined as a management plan designed from the outset to "learn by doing," and to actively test hypotheses and adjust treatments as new information becomes available. December 21, 1994 - Biological Opinion (BO) of GCD for Modified Low Fluctuating Flow (MLFF), the preferred alternative of the Environmental Impact Statement (EIS) on operations of GCD. The BO is explicit about the importance of initiating experimental flows: "If the Service believes there is not sufficient progress, Glen Canyon Dam would be operated as SASF flows (Seasonally Adjusted Steady Flow) during spring through fall (April to October) beginning in 1998. If the Service determines a study design can not be developed that is expected to provided information to support removal of jeopardy to the razorback sucker and humpback chub populations in the Grand Canyon and associated tributaries, such will be considered new information and may be grounds for reinitating formal consultation." January 5, 1995 - Bureau of Reclamation (Reclamation) staff meet in Denver. Glen Canyon Environmental Studies (GCES) to transition out for new Adaptive Management Program (AMP). January 12, 1995 - The first AMP Transition Working Group (TWG) meets in Phoenix. Minutes. February 22, 1995 - Transition Monitoring Group meets in Tempe, AZ. Minutes. March 9, 1995 - Meeting with Duncan Patton (GCES chief scientist) in Tempe, AZ, on concept of research center at Flagstaff, AZ, and called Grand Canyon Observatory. This program for long-term monitoring of Grand Canyon resources will later be called Grand Canyon Monitoring and Research Center (GCMRC) of the US Geological Survey. March 21, 1995 - GCD FEIS is filed with Environmental Protection Agency (EPA). March 23, 1995 - Transition Working Group meets in Phoenix. Minutes. March 24, 1995 - FEIS availability is published in Federal Register. March 28, 1995 - Letter from environmental groups (NGOs) to Reclamation Commissioner Daniel Beard and Reclamation's response. March 1995 - Government Accountability Office (GAO) begins audit of FEIS, as mandated by the GCPA. Signing the Record of Decision (ROD) must wait for completion of audit. April 6, 1995 - Reclamation's response to Biological Opinion. April 11, 1995 - Briefing paper for first experimental Beach/Habitat Building Flow (BHBF) of 52,000 cfs. Draft Programmatic Agreement for Cultural Resources presented. April 28, 1995 - Meeting with Steve Magnussen (staff of Interior's Deputy Secretary for Water and Science). Magnussen will become the chairperson for the Adaptive Management Working Group (AMWG), otherwise known as the Secretary's Designee and appointed directly by the Secretary of Interior (Bruce Babbitt). Minutes. May 2, 1995 - Transition Monitoring Working Group meets in Phoenix. June 20, 1995 - Meeting for Programatic Agreement on Cultural Resources for Glen Canyon Dam Operations in Phoenix. June 21, 1995 - Transition Work Group meets in Phoenix. Minutes. June 21, 1995 - Begin draft appraisal of Selective Withdrawal (Temperature Control Device). August 11, 1995 - Non-use Value Report is peer-reviewed by National Academy of Sciences. August 30, 1995 - TWG meets in Phoenix. Minutes. September, 1995 - Non-Use Value economic report to be issued. Sept, 30 1995 - GCES Phase II programming ends. November 30, 1995 - Transition Working Group meets in Phoenix where goals and objectives are discussed. A draft of final objectives is presented July 2, 1996. For example, that endangered fish populations will be maintained or enhanced at levels that were observed ten years prior (1987) and on a ten year rolling average; to attain sustainable population of humpback chub in the mainstem of the Colorado River by 2005. The population of Humpback Chub has declined from approximately 9,322 adults in 1989 to 6,017 adults in 2006, and no sustainable population yet exists in the mainstem. Minutes. February 13, 1996 - TWG meets in Phoenix. A draft appraisal of Selective Withdrawal (Temperature Control Device or TCD) is presented, and a final appraisal was completed in 1999. The purpose of the TCD is to warm the water from GCD so that endangered fish can spawn in the mainstem of the Colorado River, which is a primary objective of the AMP. See note below for October 21, 1996. Minutes. March 22 - April 6, 1996 - Experimental flows start and end with low, steady flows to measure the volume of beaches and sandbars. The main event is an experimental flood flow of 45,000 cfs from GCD to lift sand from the bottom of the river to the margins of the river. Studies since 1996 refute the original findings of the 1995 GCD FEIS concerning sediment conservation in Grand Canyon. May 21, 1996 - TWG meets in Phoenix. Minutes. Initial results of BHBF are presented. The first AMWG Charter is presented (revised in 2006). The first guidelines for GCMRC are presented. The first schedule for a Long-Term Monitoring Plan is presented. June 19, 1996 - First meeting of GCMRC (Planning Work Group) in Phoenix, AZ. Minutes. July 2, 1996 - TWG meets in Phoenix. Final objectives are presented. August 29, 1996 - TWG meeting in Phoenix. Minutes. October, 1996 - GAO completes audit of 1995 EIS on GCD operations. October 9, 1996 - Secretary of Interior Bruce Babbitt signs the Record of Decision for operations of GCD. October 21, 1996 - Reclamation announces the first public scoping for potential impacts from installing a temperature control device (TCD) at GCD. Public scoping occurred again in 2004, but as of 2008 a final action plan has yet to be delivered by Reclamation. See note for February 13, 1996 above. November 21, 1996 - TWG meeting in Phoenix. Minutes. January 9, 1997 - Temperature Control Device Workshop meets in Phoenix. January 22, 1997 - GCMRC meeting in Phoenix. Minutes. February 3-4, 1997 - TWG meets in Phoenix. Draft of Long-Term (five year) Monitoring and Research Strategic Plan is presented. Minutes. March 3, 1997 - Federal Register Notice that stipulates, among other things, that Congress will receive an annual report on the progress of fulfilling the requirements of the GCPA, and the Annual Operating Plan (AOP) process would include public participation in setting the operations at Glen Canyon Dam specific to fulfilling the mandates of the GCPA. Contrarily, only one final Report to Congress has been produced (see below) and the operating criteria specified to work with the goals of the GCPA and the Biological Opinion (see the above entry of December 21, 1994 to begin Seasonally Adjusted Steady Flows by April, 1998) were compromised by the protectors of hydropower revenue. See also the Federal Register Notice of February 24, 1998 and the AOP of 1998, which affirms status quo operations for Glen Canyon Dam. Draft 1998 Report to Congress is presented to AMP. Final 2002 Report to Congress is formally transmitted. 2008 motion to finalize a Report to Congress. March 6, 1997 - TWG meets in Phoenix to discuss Long-term Monitoring Plan. April 8-10, 1997 - First Science Symposium held in Albuquerque, NM, with papers published by the sponsor, the George Wright Society. August 26, 1997 - Special meeting in Phoenix to consider BHBF in Spring, 1998, which will not occur until November of 2004. 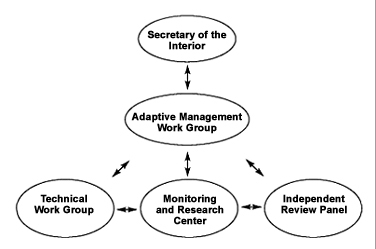 September 10, 1997 - First Adaptive Management Working Group (AMWG) meeting in Tempe, AZ. Minutes. October 2-3, 1997 - TWG meeting. Minutes. October 13, 1998 - Federal Register Notice on 4.5 foot extensions for spillway gates at Glen Canyon Dam. November 3-5, 1997 - A three-day experimental Habitat Maintenance Flow (HMF) of 30,600 cfs was performed to rebuild mid-elevation beaches and low-lying sandbars that had eroded away after the March, 1996 experimental BHBF. November 4-5, 1997 - TWG meeting. Minutes. December 10-11, 1997 - TWG meeting. Minutes. January 15-16, 1998 - AMWG meets in Phoenix. Minutes. Results of HMF experimental flow. October, 2001 - Comments on the recovery goals for endangered fish. Coggins and Gloss; GCMRC. 1990 - Agency Recalcitrance and Evasion Regarding Compliance with NEPA Relating to GC Dam Operations: A Documented Need for Congressional Intervention. Lippman. Click here (Susskind) and here (Camacho) and here (Fellers) to read objective evaluations of the Adaptive Management Program. Fellers' summary as a powerpoint presentation is here. Click here to read report by Lenard. And finally a paper by Ann Brower et al. Click here to read Environmental History of the Clorado River: A Changing Focus of Science. Bennati and Shannon. Balancing a Complex Set of Interests: Glen Canyon Dam and Adaptive Management. Water Education Fund, 2010. Click here (cached) to read Reclamation's response (10/21/09) to the critiques of the AMP. This fascinating article demonstrates that the agency is clearly not going to solve the Grand Canyon impairment issue anytime soon. 2008 - Report to the Secretary's Designee on clarifications of roles in GCD Adaptive Management Program. Click here to read a history of operations at GCD before Adaptive Management. Click here to read letter by litigants about AMP to Secretary of Interior. Click here for AMP primary documents not available on its web page. 2009 - Hydropower study by David Marcus. Table 1. Tables 2 and 3. 2010 - Answers from Grand Canyon Trust and National Parks and Conservation to Subcommittee Chairs Napolitano and Grijalva about AMP. 2011 - Analysis of the 2000 low steady flow. Ralston.